It does for me. . . minus the full makeup, the smile, the perfect hair, and the spandex clothes. 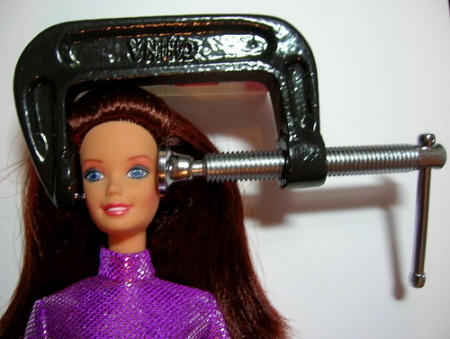 I don’t even like to use the word headache anymore because I have dealt with my own migraine enough to understand that they are a whole-body dis-ease. Today, I woke up at 4 am. I kept hitting my tooth that has a temporary crown on it. I slept off and on from 4 am to 7 am. I don’t think i had dreams, but I had a lot of “fretting” and it was not pleasant. Before work, I scrambled some eggs and they sounded really unappetizing. All I wanted was plain toast. I got to work at 8:30 and went right in to a meeting with a smoker . . .
By lunch time, I was nauseated and a bit dizzy. Back to work, with an ice pack for good measure. Only to find that there was a huge machine tearing up the driveway in front of my office. The noise was crazy and I could hardly concentrate. Ugh. Calgon could not take me away. I had a report to write. It does seem that I took my meds quick enough to stop the headache before it got worse and I could make it through the hot, humid, noisy afternoon. I was happy and it was good timing. I go to a new headache clinic/neurologist tomorrow and this will help me prepare. Soon I will post about the tracking method I now have and whether or not it helps going to the doctor or not. Anyway, I hope this document helps you too!